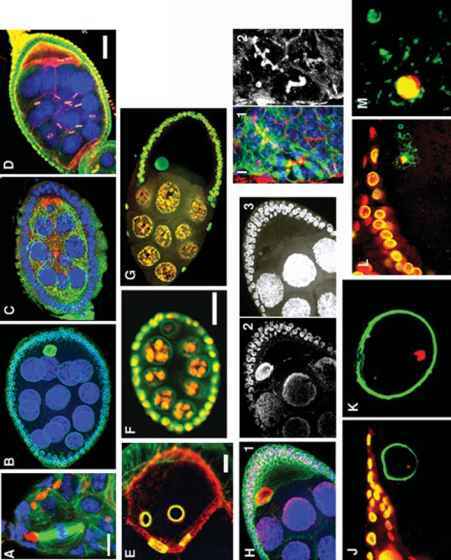 The cytology of mitotic chromosomes has proved to be essential for research into different aspects of Drosophila biology. Cytological approaches are routinely used to study mutations that affect chromosome behavior or structure. Moreover, cytological methods are essential for analyzing heterochromatin (see ref. 1 for review). This material is largely refractory to both genetic and molecular analyses because of the absence of recombination and because of its high content of repetitive DNA sequences. In addition, heterochromatin cannot be analyzed effectively on polytene chromosomes because it is underreplicated and included in the chro-mocenter. However, by applying high-resolution banding techniques (e.g., quinacrine, Hoechst, and N-banding) and fluorescence in situ hybridization (FISH) to mitotic chromosomes, one can precisely determine the breakpoints of heterochro-matic rearrangements and map different types of heterochromatic DNA sequences. Several squashing techniques have been developed for the preparation of larval brain mitotic chromosomes (2,3). Here, we describe a series of squashing protocols that we routinely use for different experimental purposes and that can be successfully applied for chromosome preparation in other Drosophila and mosquito species (4-9).